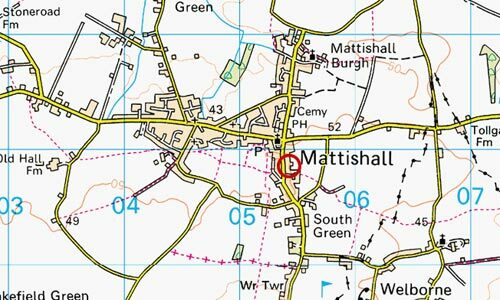 Mattishall smockmill was built in Town Lane and not long after the mill was demolished to make way for the new towermill the road name was changed to Mill Street. The mill ran two pairs of French burr stones, a flour mill and jumper. The first record of Mattishall smockmill was in 1826 when it was attributed to the Lemmon (or Leamon) family. William Butters rented the mill from John Lemmon in 1841. After William Butters' tenancy ended in 1843, John Lemmon ran the mill again until he died in 1848. After John's death, his wife Martha and son Thomas ran the mill until financial difficulties overcame them and Martha Lemmon made a Deed of Assignment for the benefit of her creditors that forced the sale of her property in 1857. 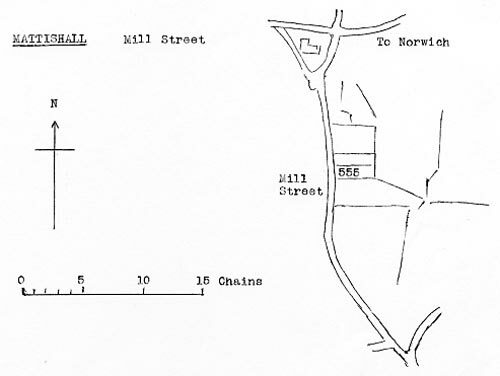 All that newly erected and substantially built Brick and Tiled MESSUAGE situate in Town Lane in Mattishall aforesaid with the Yards, Gardens, Stables, Hay-house, Cart Lodge and Store-house adjoining; and all that substantially built SMOCK TOWER WINDMILL driving two pairs of stones with the flour mill, sifter and all requisite machinery in excellent condition, situate adjoining or near the said dwelling house, comprising altogether, with the site of the said Buildings One Rood, more or less. Freehold. Arable land ... Welborne ... 6a. more or less. Copyhold Manor of Welborne. Apply to Mr. Drake, Solr., To Messrs. Cooper & Sons, or to the Auctioneer, East Dereham. Capital newly erected and substantially built Brick and Tiled Messuage or Tenement the Yards, Garden, Stable, Hay-house, Cart lodge and Storehouse adjoining together with that substantially built SMOCK TOWER WINDMILL driving two pairs of stones with the Flour Mill, Sifter and all requisite machinery in excellent condition, situate adjoining or near the said Dwelling House, containing altogether with the site of the said Buildings one rood, more or less as the said Premises are eligibly situate in Town Lane in Mattishall aforesaid. Freehold. Apply to Mr. Drake or to Messrs. Cooper & Sons, Solrs., East Dereham.